Spotify and Globe Telecom team up to discover the next big OPM act - Hello! Welcome to my blog! December Avenue Globe Telecom Jeric Medina Kai Honasan Kito Romualdez Marion Aunor Midnight Meetings Paolo Valenciano Save Me Hollywood Shehyee Spotify Spotify Emerge The Ransom Collective. Spotify, in partnership with Globe Telecom, recently launch edits Spotify Emergeprogram in the Philippines, placing local artists in the spotlight in a bid to break the next big OPM act into the mainstream. Spotify Emerge offers unique insight into up-and-coming music talent across Asia by leveraging Spotify’s wealth of data to identify ten emerging artists from the region, based on their virality (increase in streams and shares week on week). The ultimate winner will be chosen by Spotify users through streams, follows and shares. 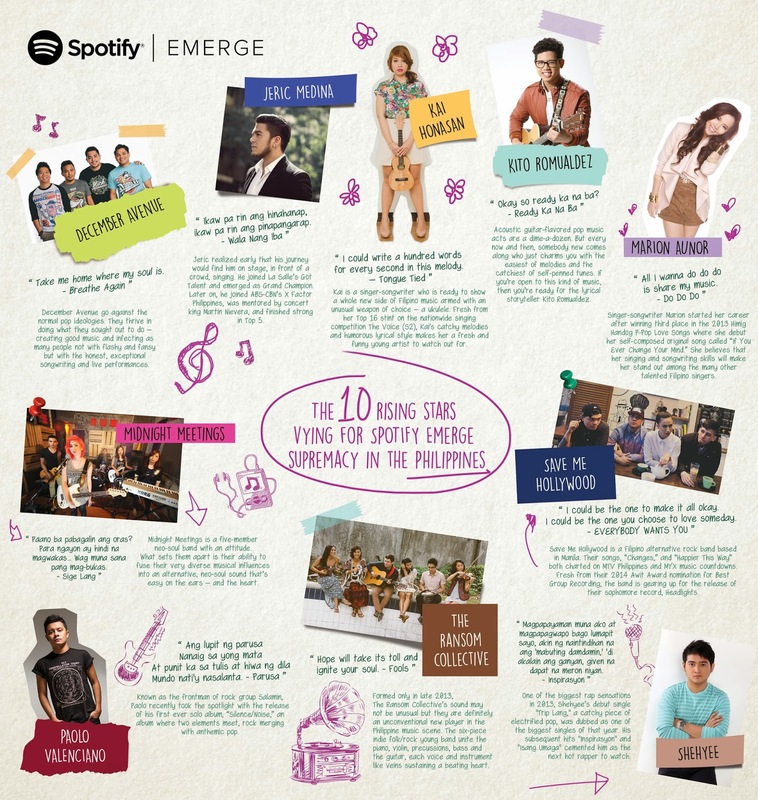 The ten rising stars vying for Emerge supremacy in the Philippines are December Avenue, Jeric Medina, Kai Honasan, Kito Romualdez, Marion Aunor, Midnight Meetings, Paolo Valenciano, Save Me Hollywood, Shehyee and The Ransom Collective. Emerge enables users to watch the competition play out on the dedicated Emerge website, which features an engaging and visually appealing graphic timeline where the artists who attract the most attention and listens are rewarded with more prominence on the site. The list of ten up-and-coming acts will be pared down each week until an outright winner is picked. Past participants of the program in other countries have included the likes of Lorde, Macklemore & Ryan Lewis, and alt-J, before they became global success stories. Meanwhile, brands who have collaborated with Spotify Emerge in other markets include Chevrolet and American Family Insurance. 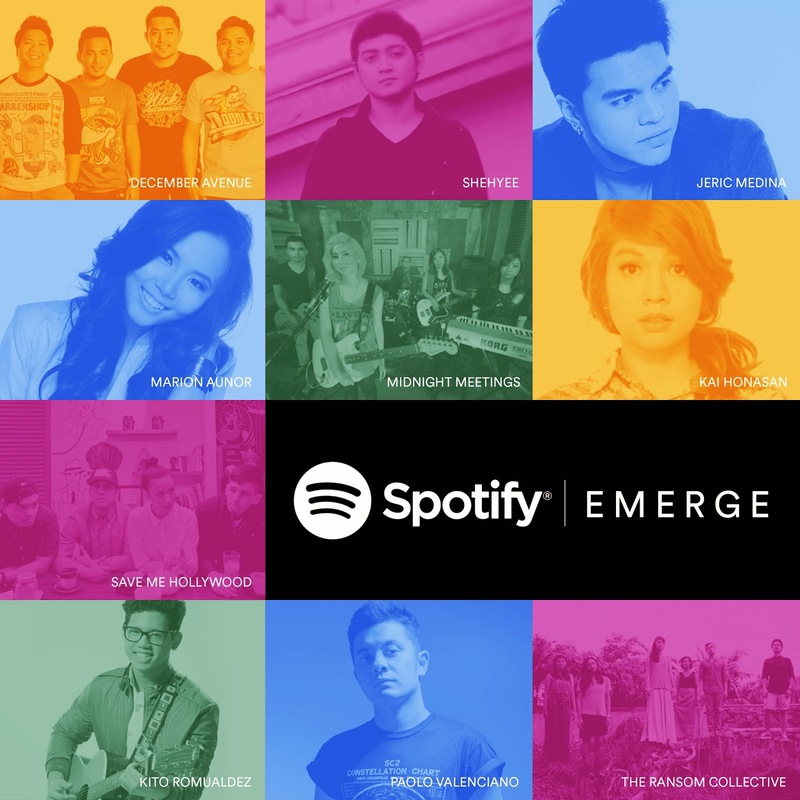 “We’re thrilled to be launching Spotify’s first Emerge program in Asia to the Philippines, our fastest-growing market in the region and a country with a rich history of music talent,” says Chee Meng Tan, Director of Label Relations, Spotify (APAC). Globe customers can access Spotify Emerge on the Spotify app, and enjoy it best with Spotify Premium. To register to Spotify Premium, Globe postpaid and prepaid customers can text SP 129 to 8888. The campaign launches today at ph.spotifyemerge.com where you’ll be able to stream, vote, share, and find out more about the ten music acts involved.